It's a2z time again. Once again God gave me the perfect word--but like so many times in life I missed it and someone else pointed out to me, this time it was Ed. It's not a figment of my imagination. It's our truck and trailer loaded with our son and daughter-in-law's truck. That makes a lot of VEHICLES-in-one. It's the ending--always the ending of a story that gets you right? 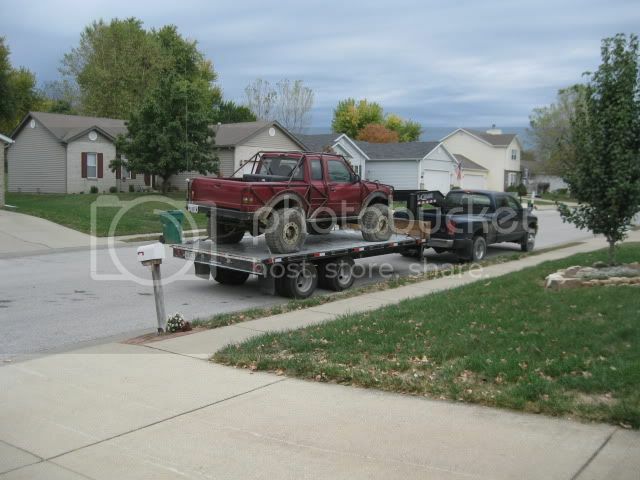 We went to Seymour, Missouri to rescue the broken off road re-vamped ranger that had lost it's ability to steer. I rode in the back seat of the truck learning to appreciate the joy of reading on my nook. I can't read a printed book in a car or truck because I get sick. This was my first car trip with the nook and now I'm hooked! After six hours on the road my husband seemed to be straining to hold the steering wheel in his hands. I think he said, "That's not good." I tried not to panic. (I do that a lot. Don't ever call me until an emergency is over.) 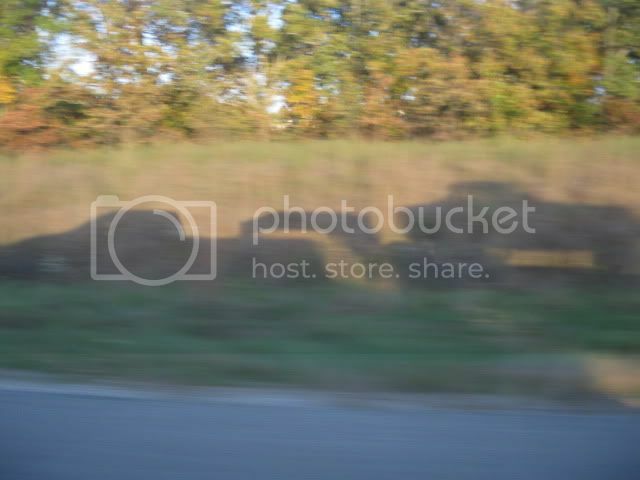 We slowed to a stop on the side of the interstate. My husband and son jumped out of the truck and headed to the back of the trailer thinking we'd blown a tire. Not the tire, but what about all the smoke coming from the truck? I'm thinking fire so I'm packing my nook, the camera and my diet Dr. Pepper in my bag ready to bail. Priorities right? No fire. Good. But semi trucks are whizzing by inches from the side of our truck and now it's dark and the truck no longer has steering, trailer brakes and it's overheating. We need a solution. How are we going to get home? Wisdom (Ed) in the front seat decides to get to the next exit by driving a hundred feet a time and pulling back to the shoulder as the needle on the heat gauge shot to the red watch out extreme over heat side of it's little circle. It took a long time to go that last mile. I prayed and wished for a bottle of peppermint tums. Ed manhandled that truck and trailer to a closed parking lot in a not-so-safe area in Illinois. He wasn't pleased when I asked him to back up so I could use the street parking lot light to read by. Just sayin' I mean, if you have no ability to fix a truck you might as well read, right? Then we remembered a good friend from church has a horse trailer. Yay! He came, connected our trailer with my son's truck and brought us home while Ed waited for the tow truck. Quite a day for vehicles. Yesterday, my son took off a half day of work and fixed our truck, so the trailer went back on and our truck took our son's truck home. For those of you who know about the insides of truck engines this was the problem. 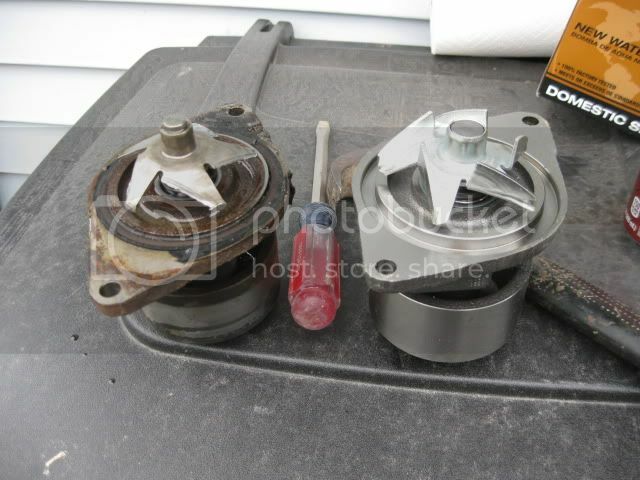 The water pump isn't supposed to look like the one on the left, notice the missing fins? * the book I was reading on my nook was Christa Allan's Walking on Broken Glass. I liked it a lot. for more a2z this week visit Patty Wysong. What a scary adventure! Glad you all were safe and that the vehicle was fixable. That is a lot of vehicles. Barb's right, what a scary adventure! Glad God had His hand on everyone involved! Harrowing! So glad it all turned out okay! Eep! I've lived that out more times than I care to think about! Just replaced the water pump in my car two weeks ago, as a matter of fact. I get carsick reading in the car too... will have to try reading on my Kindle! Whew, sounds like an adventure for sure! And yes, light to read by is right up there in my priorities. Question, why is reading a Nook different for your tummy than a paper book?